aka "Fire Emblem" for those in the west. So what are favorite characters that you guys would use in some of your playthroughs? Currently mine are Kent, Serra, Oswin, Raven and Lucius. Are you still here JonOU812? Because we gotta talk about waifus. Have you played many Fire Emblems or is this your first one? Because the first thing you need to know is that Nino is not worth raising. The next thing you need to know is that Ninian is a trash Waifu. 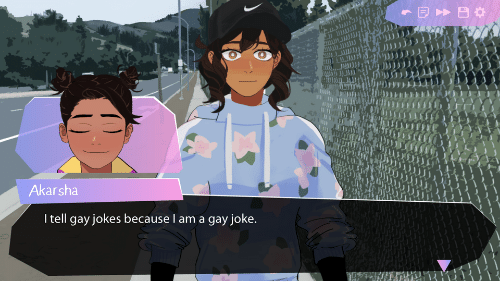 But seriously, my problem with the games where you can marry and have offspring is it gets folks so hyper focused on eugenics to make God units instead of focusing on Supports that have good stories together. Most players can get through the game with a few well raised characters regardless. Sometimes certain games require munchkining (THRACIA!!!!) But the most recent DS games have been pretty fair even for IntSys! My recommendation is to not worry so much about MinMaxing and just have fun and enjoy the game. Do what feels right and makes the most narrative sense. Pick people who compliment each other. I don't recall Blazing Sword being so full of super difficult nonsense that you needed to play the eugenics game. Insofar as what units to use? You can't go wrong with axe users. I admittedly haven't played a ton of Fire Emblem but in what I've played I've always gone for supports based on storyline reasons. Seems more fun to me than trying to min-max. Honestly one of the things I liked about the support system is how it felt different from relationship systems in other games. Rather than being encouraged to identify with the main character and pursue a romance with the love interest you like best, it's more like playing matchmaker based on which pairs you find compatible. Not that I dislike traditional relationship systems, just that I found the support system a nice change of pace. Although from what I hear more recent entries in the series sound more like a traditional relationship system. If that's true I would find that a little disappointing. Jenner wrote: Are you still here JonOU812? 1. 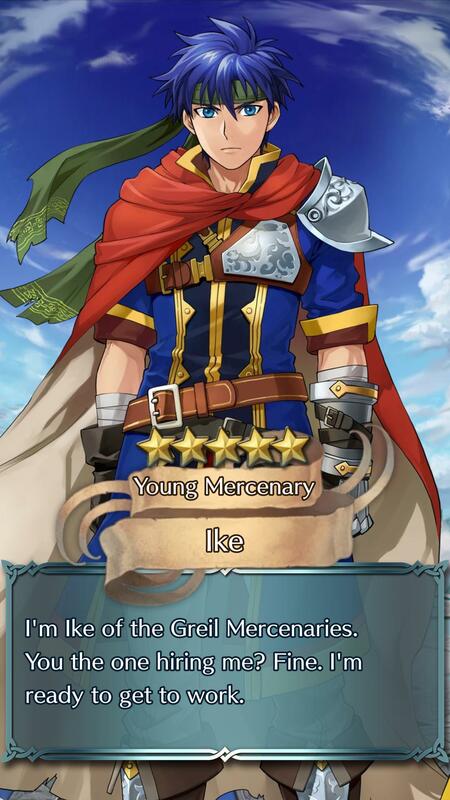 No this is not my first Fire Emblem. I've played all the GBA ones, Awakening, tad bit of Shadow Dragon and currently on Echoes. 2. I actually took the time and used Nino, and used Afa's Drop on her on one playthrough. 3. I arena abuse like a madman and promote at 20 almost every time, sometimes I even abuse seize gate chapters and grind there. 4. Most of the time I like to play casually and use different units for the endgame. Ex: Currently using Dorcas and Legualt since I rarely use them. 5. 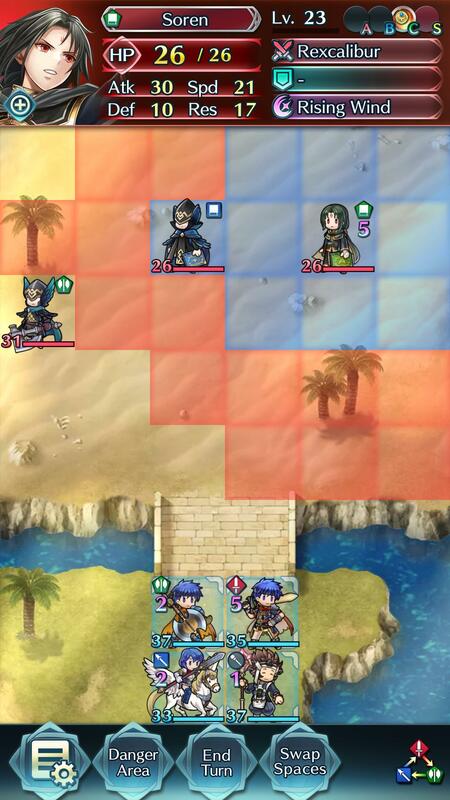 I usually tend to use different supports each playthrough but there are some units that I just can't help but not pair together like Nino x Jaffar or Lucius x Raven. 6. Lyn and Florina are best Blazing Sword waifus. Come. At. Me. JonOU812 wrote: 1. No this is not my first Fire Emblem. I've played all the GBA ones, Awakening, tad bit of Shadow Dragon and currently on Echoes. Path of Radiance is the best Fire Emblem and Radiant Dawn infuriates me because they phoned in the support system. They had a really good thing going with PoR and should make more games like it. That's just called strategy, my friend. Isn't Dorcas an axe user? It's been too long since I played Blazing Sword. If he is an axe user then good choice! Isn't Jaffar kind of creepy though? Those are some pretty solid waifus, Lyn rules and Florina usually turns out good but I once got really lucky RNG with Rebecca and she became this deadly monster of a unit and since then I've always had a mild fondness for her. Yes he is. 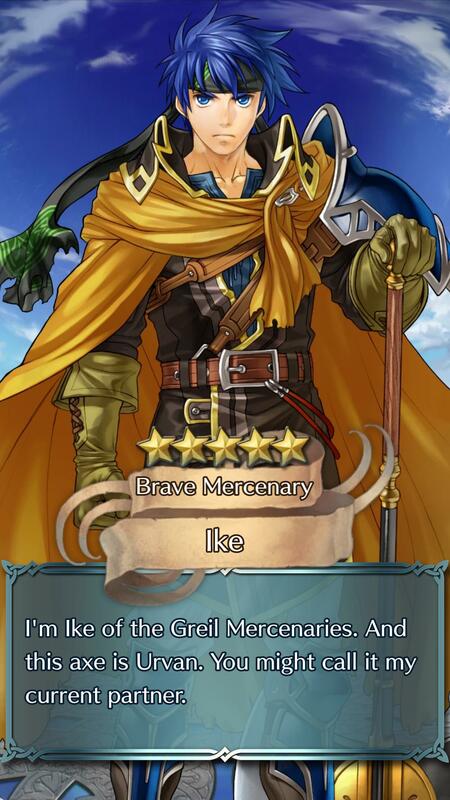 Him or Bartre, if the RNG agrees with me, Hector and Dart are usually my go to axe users. For some reason her RNG for me is either she barely gets any strength growth or just barely maxes it. I once had her at 14 Str at lvl16. 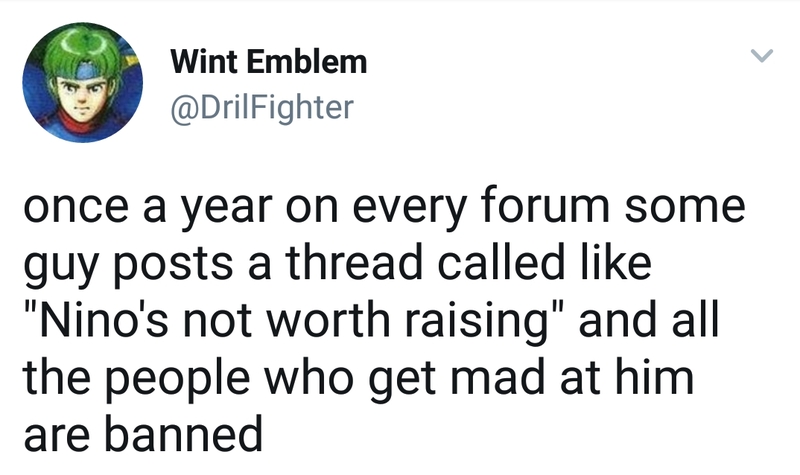 Unfiltered Fire Emblem Spoilers in this post. Re Jaffar: assassin who won't hurt kids is tropey. That's why Volke is the best because he could and would totally kill Ike. I wish IntSys would make more games like Path of Radiance and less games like the nonsense they have been making. Have you been "playing" the mobile game Jon? yea I have. I've been working on a cavalry team with Reinhardt, Eliwood, Brave Lyn and Cecilia, just need to 5 star Eliwood and Cecilia and I should be good. Been thinking about 4-5 starring Anna, Alfonse and Sharena since their popular in the arena. Jenner wrote: Have you been "playing" the mobile game Jon? 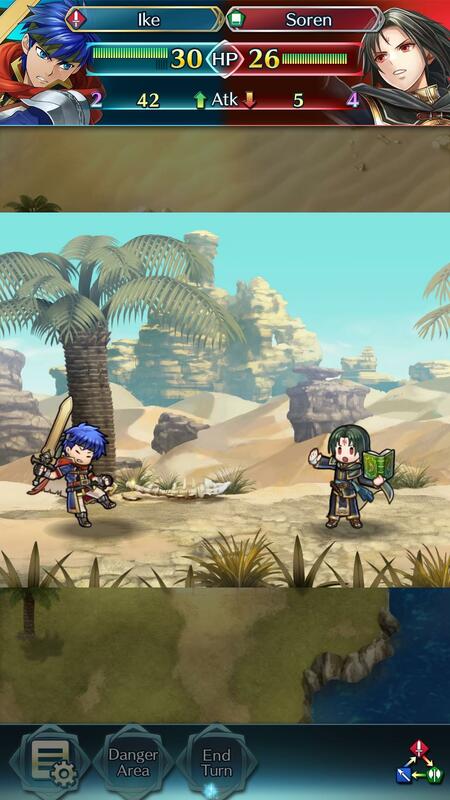 Yeah it has been tempting me because, if you're lucky enough, you can fish up Ike and Soren and then S Rank them which is my ultimate dream because they are my all time favorite OTP. I hear the new Black Knight trials are fun and challenging but that you can unlock him if you're good enough. Unlocking the Black Knight is probably the equivalent of beating the game. I may download it and fool around with it one of these days, Brave Ike has an axe so it's like IntSys is specifically marketing to me. I have been resisting its sirens call for now but I am only one woman. A friend of mine online has gotten crazy luck in this game, I'll post up their screen shots sometime. Can we all agree that Oliver is the Extra Worst Always, btw? 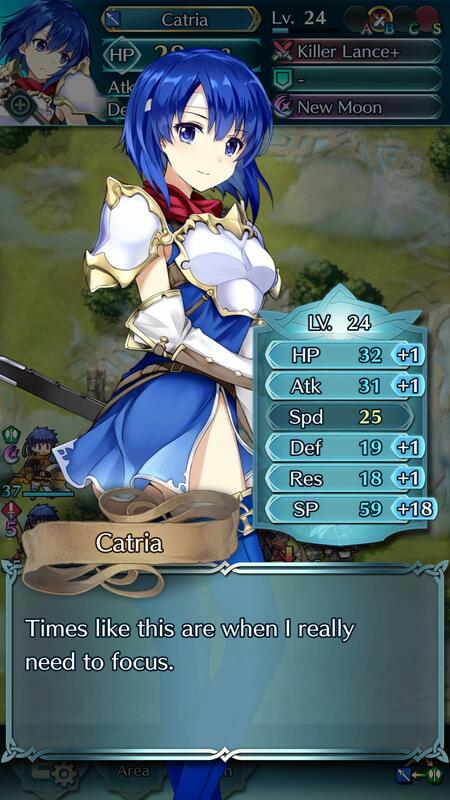 Catria and Azama tank all day. 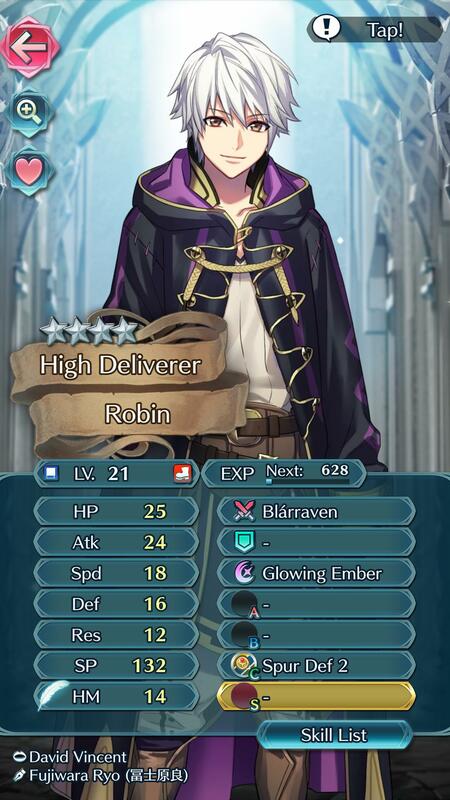 I wish my Robin was less garbage because I need a good caster. No no no no no ah -Fatal Hopper- RIP.